A while back, my grandmother had to take care of me and my bro while our ‘rents were out of town. Getting her own glimpse of our daily week life, grandma got to see some of our sophisticated hobbies, such as talking with friends, playing games, keeping up with our schoolwork, and making art. All via the computer. “Doesn’t she like to cook, or sew, or garden?” Grandma asked the family, stunned, in the days after. “Why does she never do anything?” Not only did I tell her I don’t eat dessert when she offered the pudding cups she had brought over, appalled that our family doesn’t do the whole formal dinner setting, but I’ve been neglecting my 1940’s housewife duties, too! Apparently, the solution was obvious. Today, I went out to lunch with the extended family, only to be presented a small book with a pastry on the cover and a bag of strawberry cake mix, told that I was expected to come up with a batch of cupcakes each week. “No pressure,” Mom jokingly added. So what to do with a potential batch of twenty-four pink cupcakes? Not even a good camera could save them. Towards the bottom is the one with her cutie mark, the balloons. The big yellow one is some hard candy I don’t know the name of that I found in our makeshift sweets cabinet; the smaller ones are Sweetarts. Complete with crumbled on cereal (yes, cereal), and some red Betty Crocker icing for the strings! 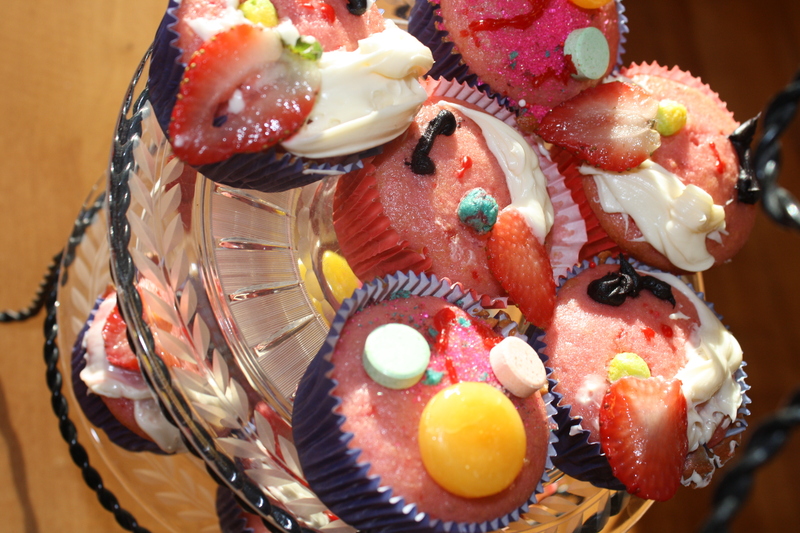 As for the ones decorated to look like Pinkie, they’re made out of frosting with pink sprinkles for the mane, a piece of Trix cereal for the eye, and uncooperative icing for the nose and mouth, topped off with strawberry slice ears. And of course, the Pinkie Pie cakes are made with 100% whole-grain Rainbow Dash. Check out the cupcakes gallery! her daughter who, all my life, could never do anything wrong. A comprehensive search online will bring you the best lenders who can offer the loans on terms that suit you best. Both Bill and Jackie paused and stared at me in a very peculiar way. Debt Service Coverage Ratio also referred in its abbreviated form DSCR.